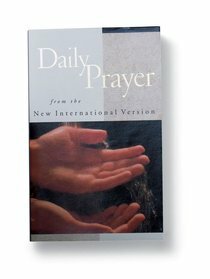 This handy mass market paperback is arranged around six topics, giving you a different, specific prayer topic for each weekday and weekend. Thoughts by well-known Christians and Scripture will help you lift up your family, your community, and your world in prayer. - Publisher Open the door to a more effective prayer life with this fresh and inspiring guide for your daily quiet time. Not just another 'how to' book on prayer, Daily Prayer is a 'what to' book- a meaningful tool to bring more purpose and passion into your time with God. Six simple topics repeat weekly to focus your heart on specific areas for prayers in your relationship with God, with others, and with the world. Filled with suggested prayers, Scripture verses, and a prayer list for each day, Daily Prayer will give you a profound insight into the heart of God. Strengthen your prayer life and discover a new oneness with God as you pray more intimately with Daily Prayer. About "Daily Prayer From the NIV"
Open the door to a more effective prayer life with this fresh and inspiring guide for your daily quiet time. Not just another 'how to' book on prayer, Daily Prayer is a 'what to' book- a meaningful tool to bring more purpose and passion into your time with God. Six simple topics repeat weekly to focus your heart on specific areas for prayers in your relationship with God, with others, and with the world. Filled with suggested prayers, Scripture verses, and a prayer list for each day, Daily Prayer will give you a profound insight into the heart of God. Strengthen your prayer life and discover a new oneness with God as you pray more intimately with Daily Prayer.